President Donald Trump “is increasingly relying” on a shadow cabinet of cable news hosts and commentators, particularly at Fox, to advise him, The Washington Post reported last month . 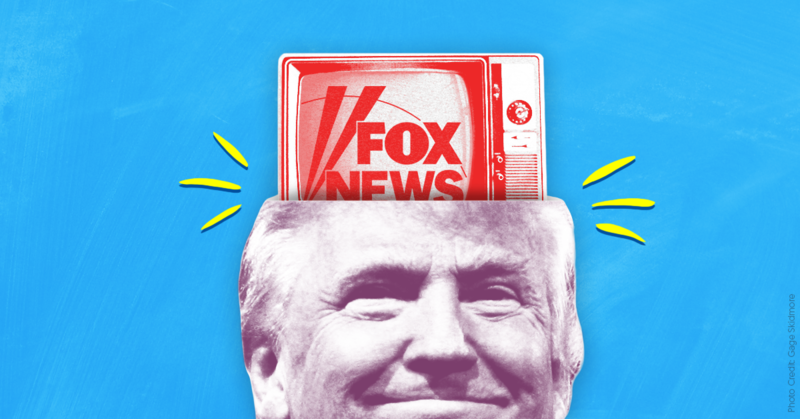 Trump’s worldview is shaped by the hours of Fox coverage he watches each day, with the president often responding to segments that catch his eye in near-real-time on Twitter. And he speaks regularly with Fox hosts like Sean Hannity and Lou Dobbs, seeking private counsel on the topics they discuss on their shows every night. These public and private channels of communication allow Trump’s on-screen allies to play a substantial role in making federal policy. Here are some of the things the president’s Fox advisers would like him to do. Remember #ReleasetheMemo? Earlier this year, Trump’s congressional and media allies frantically hyped  House intelligence committee Chairman Rep. Devin Nunes’ (R-CA) secretly drafted document as a silver bullet that would prove special counsel Robert Mueller’s investigation was illegitimate. The FBI, they claimed, had illegally obtained warrants from the Foreign Intelligence Surveillance Court to surveil former Trump campaign aide Carter Page by concealing the political origins of a dossier included in the evidence provided to the court. When the memo finally came to light after weeks of over-the-top buildup, the result was a calamitous flop  for Nunes and his champions: The memo provided little new evidence and acknowledged that the FBI had disclosed  the dossier’s origins. Get ready for more of the same. This time, Trump’s most loyal congressional and media allies are calling for Trump to declassify and release unredacted pages from the Page warrant. They're also calling for the release of documents related to Justice Department official Bruce Ohr’s purported  role as a “middle man” between the DOJ, British former intelligence officer Christopher Steele (who compiled the document), and Fusion GPS, the research firm that employed both Steele and Ohr’s wife, Nellie. This campaign apparently succeeded, with the president reportedly planning to declassify the documents  as soon as this week. As with the Nunes memo , Trump’s supporters are trying to create a spectacle in order to divert media attention away from the damning results of the Mueller investigation , give his base something to shout about, confuse the public, and lay the groundwork for Trump to hamstring the probe . On Wednesday, the Senate intelligence committee questioned Facebook COO Sheryl Sandberg and Twitter CEO Jack Dorsey about the role social media played in enabling Russian interference in the 2016 election. The hearing “was the culmination of a two-year investigation into Russian election interference by the committee and Congress’ best opportunity to publicly hold Facebook and Twitter accountable for their role in allowing Russian operatives to game their platforms to target Americans with propaganda,” as my colleague Melissa Ryan put it . But Trump’s media allies aren’t terribly interested in preventing Russia from helping Republicans win elections, with their focus instead on blasting the tech companies for their purported bias against conservatives. Lynette Hardaway and Rochelle Richardson, sisters who produce Trumpist videoblogs under the stage names Diamond and Silk, are at the center of this effort. The pair have made more than two dozen appearances on Fox this year, regularly offering hyperbolic criticism of social media platforms (they have declared themselves the victims of the “new Jim Crow”  and accused tech firms of “political lynching” ). Their Fox platform garnered them an invitation to a congressional hearing earlier this year, an opportunity they used to push debunked claims that Facebook is censoring conservatives . For decades, conservatives have criticized the purported “liberal bias” of the news media , using that argument to defang negative coverage and urge journalists to provide more positive coverage of its leading lights. More recently, they’ve deployed  that same strategy  against social media platforms, pushing fabricated social media censorship claims  in order to push for preferential treatment for themselves on those platforms. Trump watches his supporters making nonsensical claims of censorship on Fox and then catapults the discussion by commenting on the segments he sees. That cycle turns nonsensical claims of bias into federal policy. Two weeks ago, the president criticized Google  after watching Diamond and Silk attack the company’s “tyranny” on Dobbs’ show. Hours later, his top economic advisor told reporters that the administration was considering new regulations  on the company. Trump told reporters Friday that he is willing to shut down the government because it’s a “great political issue.”  That’s not new -- the president has been threatening a government shutdown  for more than a month, saying it would give him leverage with Democrats to extract concessions on immigration policy. Republican congressional leaders are against  this strategy. But some of the people Trump listens to the most are for it. Keep an eye on this story. Trump threatened to veto a spending bill in March , perhaps because he saw criticism of the legislation earlier that morning on Fox & Friends. It’s hard to imagine that he’ll complete his term without trying out the Limbaugh-Levin-Hannity strategy -- especially if Democrats take back the House.